There are a number of statues and sculptures around Hatfield. Some are by internationally renowned artists, others by less well known but not necessarily less talented ones. Sadly, Hatfield has effectively 'vandalised' one leading sculptor's work. Sir George James Frampton – born in 1860 he was the youngest artist of his time to become an RA, and was England's most prominent sculptor. He exhibited his work internationally and received awards from America, Belgium, France, Germany and Spain – including the Medaille d'Honnneur at the Paris Exposition of 1900. In 1894 he became an associate, and then a full member of the Royal Academy in 1902. He was knighted in 1908, and was President of the Royal Society of British Sculptor (1911-12). His work is on display as far afield as Winnipeg in Canada, and Government House in Delhi, India. In London his best known work is the Edith Cavell Memorial, near Trafalgar Square, and the Peter Pan statue in Kensington. 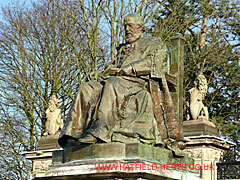 His statue of the 3rd Marquess of Salisbury stands outside Hatfield House. He depicts the former Prime Minister wearing the robes of Chancellor of the University of Oxford and the collar of the Order of the Garter. It was unveiled by Lord Clarendon, Lord Lieutenant of Hertfordshire, in front of over 2,000 people on 20 October 1906 (Please see under Hobbies and Collections – Picture Postcards). The corner of the base closest to the gatekeeper's lodge is inscribed 'Geo Frampton RA 1906'. Eric Kennington – achieved early success with his drawings of Arabs in what was then called Trans-Jordania (made possible thanks to an introductions from T E Lawrence – Lawrence of Arabia), these were used to illustrate Lawrence's book Seven Pillars of Wisdom. Served as an official artist in both WWI and WWII. Also renown as a sculptor, he carved the 15ft pillar used as a base for the model DH.88 Comet Racer which stands in front of the Comet Hotel in Hatfield. He also created the memorial to Geoffrey de Havilland Jr in the de Havilland HQ building. Married into the Exeter branch of the Cecil family (Hatfield branch originally ennobled as the Earl of Salisbury) . Ralph Brown – elected an associate member of the Royal Academy in 1968, and a full member in 1972. A student of the Leeds School of Art, then the Hammersmith School of Art, before studying at the Royal College of Art (1952-56). During this time he also studied under Ossip Zadkine, a Russian artist and sculptor based in Paris, who was part of the Cubist movement (1914-1925). Ralph Brown later became a tutor at the Royal College of Art from 1958-69. In September 1962 his water sculpture, The Swimmers, was unveiled in the Market Place, Hatfield (in front of what was The White Hart's pool hall). It was later moved to White Lion Square, and then to the front of Hatfield Swim Centre. It is still there today, although the statue has been left high and dry and a sad reflection on what it was originally – the fountain, pool and backdrop were 'lost' during its travels around the town. Not surprisingly, it usually does not appear in lists of his work on public display. However, Ralph Brown fared much better than his sculpture and his work is cherished in art collections in Australia, Austria, Netherlands, South Africa, USA, and several locations in Britain (including the Tate). Keith Maddison – artist and sculptor. In 1986 started career as a professional artist after 12-years of teaching Art. Held his first exhibition at the Aviodrome, Netherlands' national aerospace museum near Amsterdam. In 1990, created first large scale commission – a statue of Captain E E 'Ted' Fresson – for Inverness Airport. Became a full member of the Guild of Aviation Artists (GAvA) in 1995. Won GAvA's Best Aviation Painting of the Year in 1997 (and 2007). In July 1997 completed the bronze statue of Sir Geoffrey de Havilland for the University of Hertfordshire's College Lane Campus. It was unveiled by Prince Phillip, in the presence of actress Olivia de Havilland (a cousin of Sir Geoffrey) and lyricist Sir Tim Rice (whose parents worked at the de Havilland headquarters in Hatfield). Keith Maddison also created the 2 brass plaques, with de Havilland aircraft in low relief, behind the main statue. In 2000 he departed from aviation themes to create the 3m high statue of England, Middlesborough FC, and Oldham Athletic Football Club captain George Hardwick, which stands in front of the Riverside Stadium at Middlesborough. He has also created statues of WWII hero Pilot Officer Andy Mynarski VC for Durham Tees Valley Airport and the City of Winnipeg, Canada. Henry Spencer Moore (1898-1986) – better known as Henry Moore, considered by many to be the finest British artist of the 20th Century. The seventh child of coal miner Raymond Spencer Moore – a self-educated man, socialist, and trade unionist. Although his success earned him a fortune he was considered to be a socialist (some even thought a Communist). He reportedly turned down a knighthood as he felt it would separate him from fellow artists. Henry Moore won a scholarship at Castleford Grammar School, where he was encouraged by his art teacher but followed his father's wishes and first trained as a teacher. His teaching career was cut short by WWI. His active service in France ended with him being invalided back to Britain suffering from the effects of poison gas. However, what he experienced left its mark on him and influenced his work (other key influences are believed to be his close relationship with his mother, and the lack of a child from his own 57-year marriage to Irina Radetzky). In 1919, with a government grant, he enrolled at the Leeds School of Art. Here he passed the sculpture exam and gained a scholarship with the Royal College of Art, and in 1921 moved to London for three years training (gaining his diploma in two). Completing his post-graduate studies in 1924, his exceptional talent saw him offered, and he accepted, a 7-year tenure as a part time instructor at the Royal College, and a travelling scholarship to France and Italy. He held his first one man exhibition in 1928 in London, and married Irina the following year. His career went from strength to strength. In 1940, the Moores moved to Perry Green, Much Hadham, Hertfordshire – now home to the Henry Moore Foundation (which he founded in 1977). The largest exhibition of Moore sculptures at an English Country House was the longest running event in Hatfield House's 400th anniversary year. Originally scheduled to run the length of the open season (23 April-30 September), it was extended by two days and finally closed on 2 October 2011. The 14 works on display were: Large Reclining Figure (1984, fibreglass); Torso (1967, bronze); Mother and Child (1949, bronze); Relief No.1 (1959, bronze); Large Totem Head (1968, bronze); Reclining Figure: Angles (1979, bronze); King and Queen (1952-3, bronze); Three Piece Reclining Figure: Draped (1975, bronze); Locking Piece (1963-4, bronze); Reclining Mother and Child (1975-6, bronze); Two Piece Reclining Figure No.2 (1960, bronze); Hill Arches (1973, bronze); Reclining Figure: Arch Leg (1969-70, bronze); Reclining Connected Forms (1969, bronze); and Draped Reclining Figure (1952-3, bronze).